This new production rectifier tube is directly heated just as the original RCA 5Y3's and we consider these to be the best available. 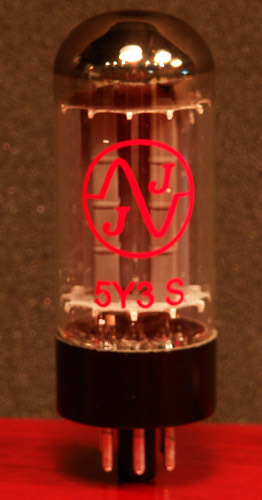 Other current production 5Y3's made in China and Russia are indirectly heated and as many of you have found out, these tubes produce higher voltages and do not have the same feel as a proper directly heated 5Y3. Our 5Y3's are tested in a custom rectifier tube test fixture. This unit allows us to select multiple reservoir cap values and it features a standby switch between the reservoir cap and rectifier tube. This standby switch configuration is the absolute hardest on rectifier tubes and commonly used in guitar amps. Replicating this allows us to apply the the full inrush current from the reservoir cap with the rectifier tubes highest rated values. 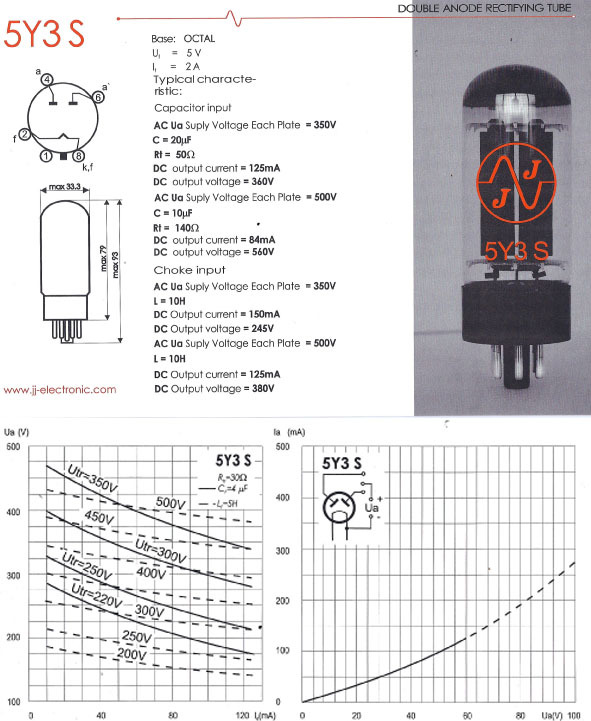 The JJ 5Y3S is a modern production replacement for all classic 5Y3 rectifier applications. The JJ is a proper directly heated recreation that has the correct voltage output and feel. If you're used to using the Sovtek and Chinese variants you'll be pleasantly surprised. These tubes are rated for a maximum reservoir capacitance of 20uF. We've found that to be an extremely conservative rating and have had great success using the JJ 5Y3S as a lower voltage substitute in 5U4 and GZ34 applications. This is great in amps like the Orange AD30, JTM45's and even a Dual Rec where reduced headroom/output is desired. Keep in mind these substitutions are done at your own risk. If you have questions about this please contact us regarding your specific application.